Place rack in lower third of oven and preheat to 400 degrees F.
On a lightly floured surface, roll out the dough to 1/8-inch thickness to fit a square pan. Press the dough into the pan and trim the dough, leaving a 1/2-inch overhang around the rim. Fold in the excess dough and press it into the sides so they are thicker than the bottom. Refrigerate for at least 30 minutes. Line the tart shell with parchment paper and fill with pie weights. Place on a baking sheet; bake until the shell is set, about 20 minutes. Remove the weights and paper; continue baking until the shell is golden, about 5 minutes more. Transfer the pan to a wire rack and let cool completely. Meanwhile, arrange the asparagus in a single layer on a baking sheet. Toss with the olive oil and season with salt. Roast until tender, about 20 minutes. Let cool completely. Reduce temperature to 375 degrees F.
In a large bowl, whisk together the eggs, milk, cream and Parmigiano-Reggiano cheese, the 1/2 teaspoon salt, pepper, nutmeg, and herbs. Pour into the cooled tart shelll. Sprinkle with 2/3 of the goat cheese. 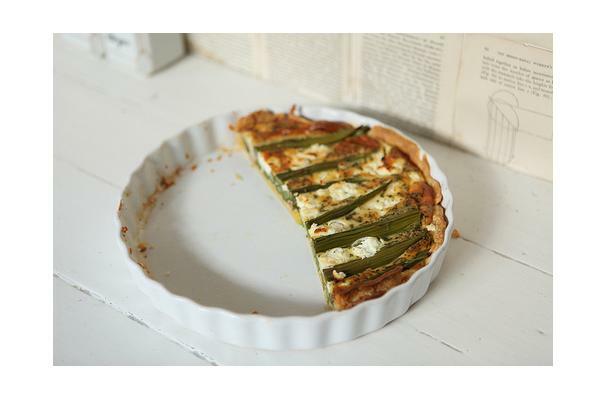 Arrange the asparagus spears lengthwise across the tart in a single layer. Sprinkle with the remaining goat cheese. Bake until the tart is golden around the edges and a knife inserted in the center comes out clean, 25 to 30 minutes. Transfer the pan to a wire rack and let cool for 5-10 minutes before serving.